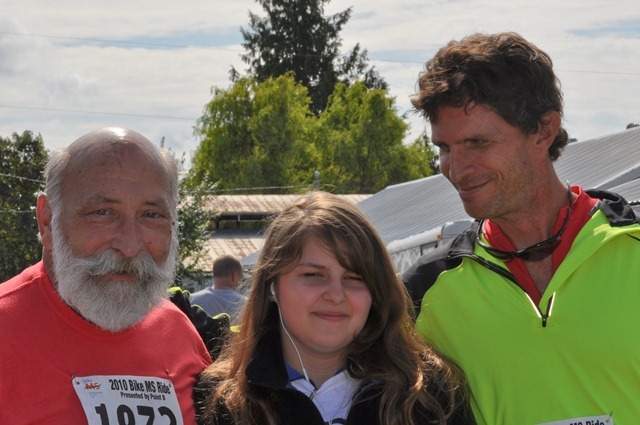 This time last year, my daughter motivated me to participate in the MS Ride in Mount Vernon Washington, about an hour north of us. It was a great experience for both of us. This was her farthest ride to date, and it was an opportunity for me to share the time with her. We also got to raise money for the MS Society, a cause we both believe in – helping people living with Multiple Sclerosis. My mother and uncle both live with this condition. Watching them face this with courage and grace is incredibly inspiring. I wasn’t entirely surprised when my daughter expressed interest in riding for MS again this year. But we were heading off on a trip overseas, so we deferred our decision until we returned – just a couple of weeks before the big ride. But what did surprise me was that my father decided to join us. He has lived with chronic back pain for many years, undergoing multiple surgeries over time, and his mobility has been seriously affected. Back in April, he had hip replacement surgery. This was a difficult decision, as it wasn’t clear that it would address some of the more serious pain. 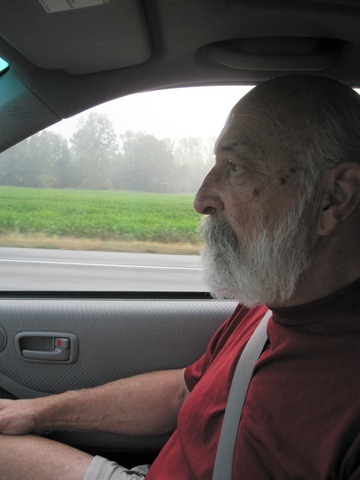 It was the least invasive of two procedures he was considering, so he decided to chance it. The first day, following the surgery, he was already testing his limits. He was annoying the medical staff and his family by getting up and around on his own. When we were able to ignore his risk of falling, we felt encouraged that he wanted to be up and around so soon. Over time there were good steps forward, and some reverses. Then at some point, he started hitting the gym, and spending time on the recumbent bike. 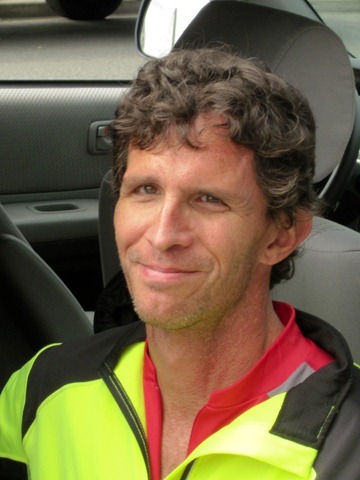 One day, when we were heading to a baseball game, he reflected that he’d surpassed an hour on the bike – just two and a half months or so after the surgery. Wow. 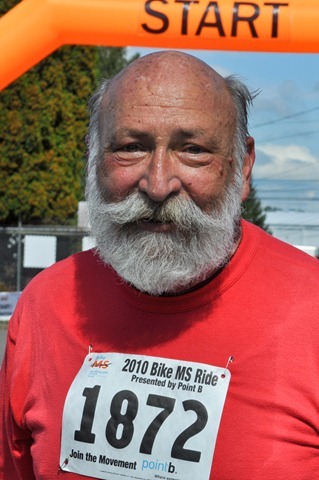 Then he got the idea that he’d like to do the MS Ride – benefitting the MS Society. In addition to numerous services they offer people living with MS and their families, the MS Society also funds lots of research – furthering prospects for treatment that help people live with MS, and working for a cure. He was in shape to do it – there was just the matter of finding a suitable bike. 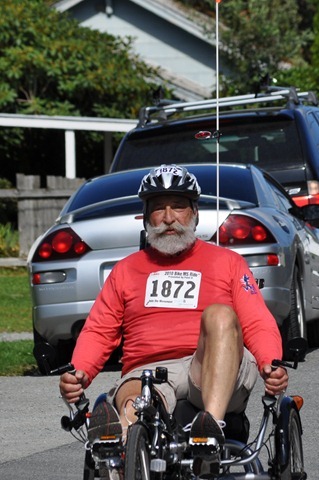 The week before the event, Dad spoke to a good friend of ours and got a loaner recumbent bike (thanks Mitch!). This would remove any risk that he’d fall and re-injure his hip. 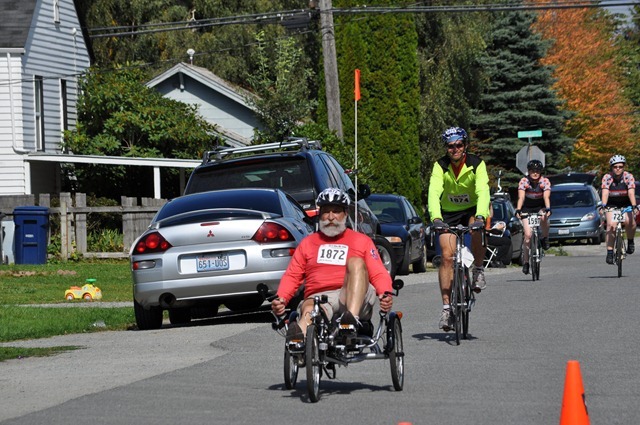 In the days before the ride, we started fundraising, ultimately raising over $1600 combined. Everything had come together very nicely. The morning of the ride got off to an exciting start. I set the alarm incorrectly, and woke up a bit late. We hit the road nearly a half hour later than we’d intended. We were getting close to the deadline for starting the ride. We arrived in Mount Vernon, and parked in the same place we had last year – about a half mile from the start. After scrambling to put our numbers on as they counted down, we were off. My daughter left us in the dust right away. 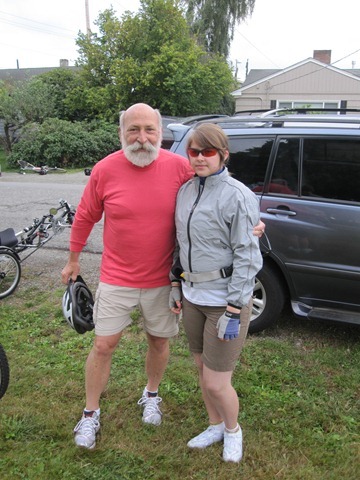 Dad and I peddled through the town, and then headed out on the long straightaway which comprised most of the ride. Almost immediately, my dad recognized that the riding this bike was more difficult than the stationary bike he’d trained on. That was a concern – especially since he’d not really ridden this bike very much prior to the event. Directly behind us was the sweeper vehicle, which made me nervous. It’s possible that they would discourage us from sticking with the ride, as we were in the back. But they turned out to be very nice, and encouraged us to stay with it as long as we wanted – offering great moral support and even helping me find the bolt to reattach my pedal when it fell off several miles into the ride. It felt like the first half of the ride was us simply getting a rhythm. He’d adjusted the seat to improve his leg extension, and that seemed to help. About two miles from the turnaround, my daughter came riding back the other way, heading for the finish. Seeing her fly by smiling was great! Then about a third of a mile from the halfway point, we came to a long hill. Dad stood up, clearly in some pain. His hip was cramping, and he was feeling the fatigue. I thought there was a good chance we’d call it a day then. Given what he’d demonstrated in getting to the start, this still would have been a huge achievement – even without finishing. When we regrouped at the halfway point, we reviewed our options. We could catch a ride back to the start, and call it good. Or we could give it a try, and call for aid if we needed it. Not surprisingly, Dad said he’d like to give it a try – and so we did. The road back was a bit easier. We had a slight tailwind, and the day was warming up a bit. We settled into a steady pace, and also took some short breaks when we needed to. Before too long, we’d covered most of the miles. As we headed over the bridge that took us back into downtown Mount Vernon, I asked him how he felt now that he had over twenty miles under his belt. As we rounded the corner heading into the finish, we could see Mom, Kris and my younger daughter cheering us on. I’ve crossed my share of finish lines before, but this one was definitely very special. 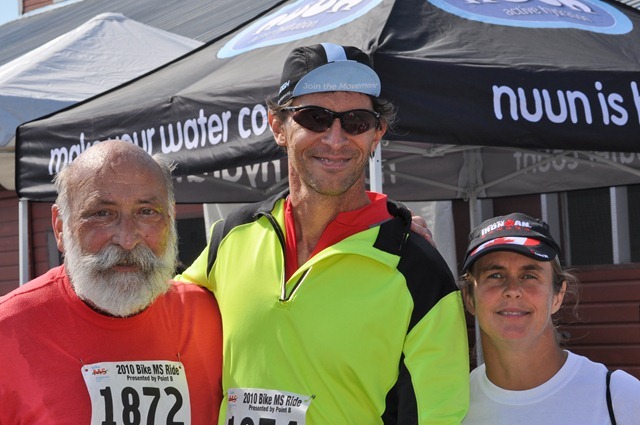 I’d gotten to share the experience with a man I love, who surprised himself and the rest of us by making it to the starting line. And on the day of the event, he showed us what it means to push through challenges. And we did this in support and celebration of two people we love very much – Mom and Uncle Stephen. A great day for a ride that I’ll remember for the rest of my life. many of these pictures were taken by Susan David. These and other pictures taken at the event are available here. This morning, Kayla and I joined a bunch of other folks to ride in support of the MS Society. We had a beautiful morning, and a lot of fun riding. Back a couple of months ago, we were talking about something around the dinner table. A question came up about a second helping of dessert. I’d used the marginal excuse that I’d done a long run that morning, and remember telling Kayla that if she would do the MS Ride with me, that she might be able to get a second helping sometime (she doesn’t recall this herself, so perhaps we can avoid dishing out that second helping). In any case, she agreed. Very promptly, she set up her fundraising site, and sent mail out to friends and family. Within a couple of days, she’d cleared the minimum fundraising goal, and faithfully upped it. Then she got on me for lagging behind her efforts … so here’s my fundraising site too. It all worked out nicely. Between the two of us, we’ve ended up raising close to $2000. Not bad for an effort started over dessert! Our training was a bit more sporadic than I would have liked. We didn’t get out for many quality rides, and I was a little concerned about how things would go the day of the event. Following Kayla’s 15 miler with Kris while we were up in Penticton BC a couple of weeks ago, I was confident that we would finish. I wanted to make sure she’d have fun though, because I’d like to make this a regular thing. In the end, both of us were just fine. Eighty degrees, sunny, and a nice, flat course made things work well. We got up early, and after a good breakfast, headed the sixty miles north to Mount Vernon. Preparing the night before was a bit disorderly, but as it turns out, nothing was forgotten or omitted. We arrived at the "Riders Village" just after 7:30, and picked up out packets. After getting situated, we hit the road at 8:22 in the morning. Kayla smiled as we rolled, as said "I guess we’ve started". Note to self – I need to learn to take things this easy when starting a marathon – it’s a perfect attitude. WE wound through downtown Mount Vernon a bit, then followed a line of bikes out towards La Conner. Our pace was steady and sustainable. Based on our training rides, I’d figured we’d be able to keep at least an 8 mph pace. We were better than that, gliding out the Skagit Flats at a 10-12 mph pace. The speedsters passed us, and we passed some other folks. I was genuinely impressed with the way Kayla conducted herself on the road, faithfully signalling and calling out "on your left" as she passed people. Just under 55 minutes later, we reached the turnaround at about 11 miles. I was pretty amazed at how well things had gone so far. And even more amazed when Kayla protested us taking a water break, saying "But I want to keep going!". Under protest, she consented to a brief 4 minute break, and then we headed back. 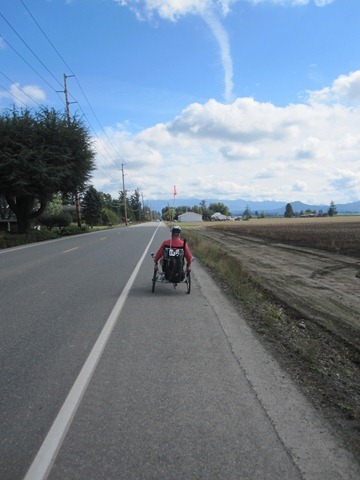 Riding under the blue sky, I was smiling the whole way, particularly as we passed the beautiful profile of Mount Baker while heading back towards the finish. Our pace on the way back felt a tiny bit slower to me, and the time would verify this feeling. But we weren’t off by much (about ninety seconds longer). 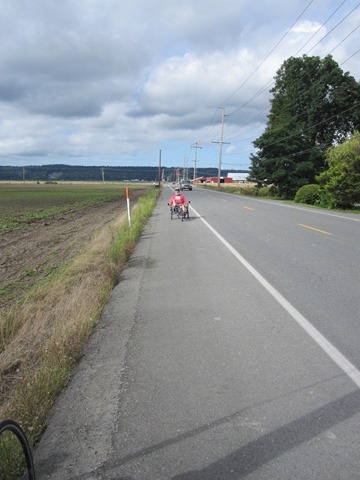 We exchanged a few stories, and got excited when we rolled back across the Skagit River, entering Mount Vernon again. And I can’t tell you how nice it felt crossing the finish line with my daughter, 1:55:45 after we started. This was about four minutes faster then the ‘A’ goal I’d had for us, and over an hour faster than our ‘B’ goal. We hung out for a short while in the Rider’s Village. 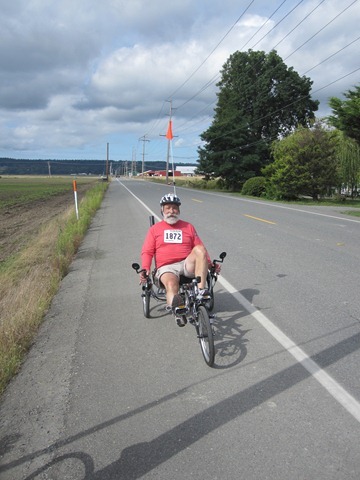 We spent some time talking with Michael, a rider from Oregon, living with MS. Michael showed us his three-wheeled recumbent bike, which allows his to ride with us. He’d volunteered for over ten years before finding this bike which allows him to ride, despite experiencing some trouble with his balance (a common symptom of MS). We talked a bit about how Kayla’s Grandma Susan and Great-Uncle Steve are both living with MS, and how I’d give anything to be able to ride anywhere with them. We called home with our news, snapped some pictures, and then headed home. What a morning! I always enjoy getting out and enjoying the sunshine like this, and enjoy it more with my daughter. Especially since she’s the one responsible for inspiring me back onto my bike following my bike accident last July. Even better was that we got to do this in support of a cause we really believe in : getting to a cure for MS, and funding education and patient services for folks living with MS.
I’m very proud of Kayla’s efforts here. She did a great job with the fundraising, challenged herself to ride as well as she could, and she was very good company. As Kayla likes to say "Today is a gift, that’s why they call it ‘the present’ ". 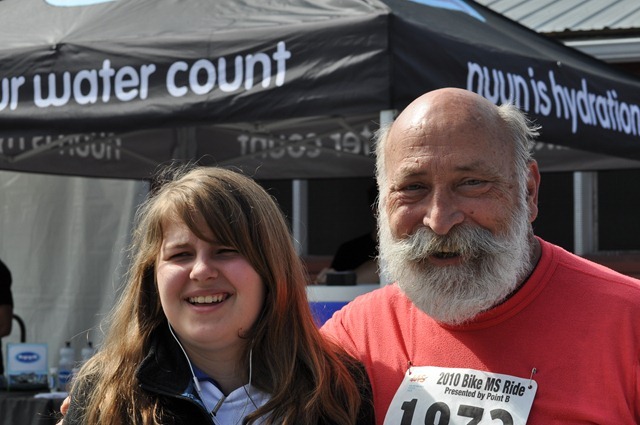 Tomorrow Kayla and I will ride 22 miles to raise money for the MS Society. This has been a ride I’ve wanted to do for a number of years. And it’s very fitting that I get to do it with the kid who got me back on my bike following my bike accident last year. This endeavor with Kayla has been fun. As our kids grow and become more independent, devoting energies to things we both believe in (such as supporting research to prevent and treat MS, and human services for people living with it) is a great gift of time. Our training has been a bit light. I can’t always convince Kayla to get out and ride, in order to prepare for the miles. It’ll be fine, although might go a bit more slowly than it could have. But it’s supposed to be a beautiful day – up near 80. 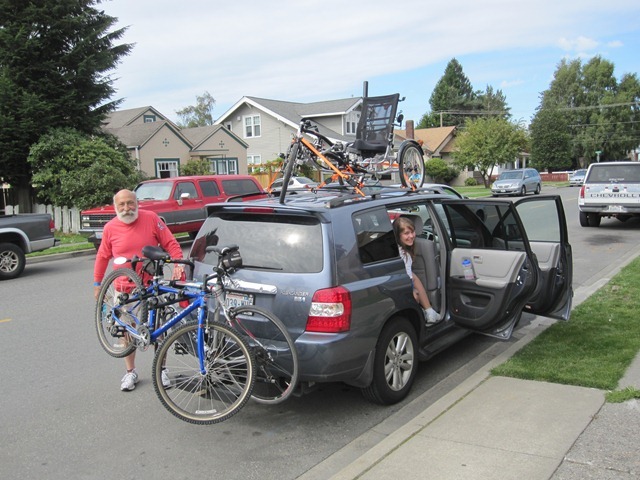 As we ride we’ll be thinking about my mother and uncle, who both live with MS. They’ve faced this challenge with grace and courage, and given us a great example as a result. It isn’t so much what circumstances we encounter in life, as how we respond to them. That’s what helps us define ourselves. It’s not too late to give to the cause. Saturday morning I attended a talk about Multiple Sclerosis with my parents. The topic is germane to us because my mom has it (finally diagnosed 3 1/2 years ago). Her brother was diagnosed about a year and a half ago too. It’s a wicked disease, that presents in different ways with different people, and can be difficult to diagnose. Mom’s progression has been kind of slow. She’s able to walk, although not nearly as far as several years ago. Treatment seems to help her, essentially holding her MS more or less at a stalemate recently. The last few years have been a real education for us. Having a chronic incurable condition really stinks, but I admire the courage mom has shown in dealing with it. That’s not to say she’s not scared about what lies ahead, and that she doesn’t get frustrated. But she seems to focus on the things she can control (securing the best treatment, engaging a support system of doctors, and other patients) rather than dwell on what she can’t control. It is an autoimmune condition in which the t cells attack the myelin sheathing on your nerves. There appear to be several distinct types of autoimmune activity that happen in different cases. Sometimes the t cells appear to go haywire and attack the myelin. Sometimes something bad in the myelin appears to trigger the autoimmune response. In either event, the end result is demyelination. There are apparently two distinct phases to the disease : inflammation and degeneration, although I can’t find these phases detailed online now. Early treatment (during the inflammatory phase) seems to have positive bearing on staving off disability. This may be because actual nerve damage (axon death) has not yet occurred, and because it is possible to "remylinate" (regenerate the myelin sheath around nerves). People who live farther from the equator have a higher incidence of MS. This may indicate a correlation with Vitamin D deficiency. There are more cases concentrated in the Seattle area than in any other city in the US. Seattle sits at an oblique angle from the sun, and has more cloudy days than many other places. Apparently the disease prevalent in sunnier climes is pretty different in profile than it is where we live. It is unclear whether the origin is genetic, environmental, or a combination of both. The disease may be triggered by environmental factors (such as a Vitamin D deficiency), but you may be at increased risk if you’ve had certain viruses in the past. There is apparently a 10:1 ratio of nerve lesions to "exacerbations". This means that nine of ten lesions go clinically undetected. Rather than effecting one’s ambulatory abilities, they most likely hit the cognitive or emotional capabilities. There is about a 40% incidence of depression in MS patients. Wow. Several months back, mom told me that she’d met someone I know from work in an MS support group. I hadn’t seen this guy in about ten years, and from time to time had wondered what happened to him. I knew him as a very good engineer (I know folks who have worked with him), and remembered that he was very active too. 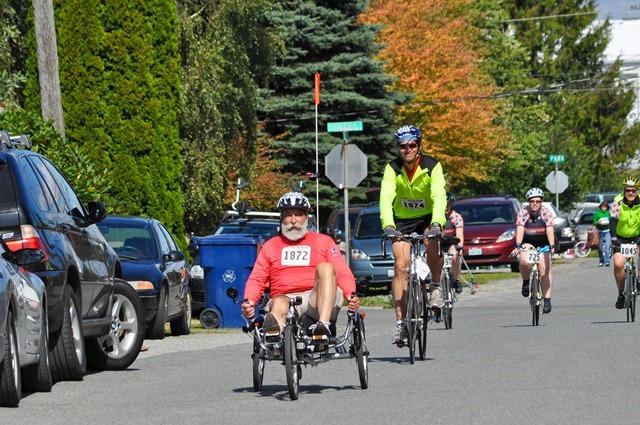 He told me that the week he was diagnosed, he’d ridden his bike 150 miles. In six weeks, he progressed to the point that it was difficult for him to walk 50 yards. We had lunch together and he told me a bit about his experiences living with MS – dealing with some of the physical and cognitive issues. This second-hand life experience has been a real education. Beyond understanding the physical consequences of MS, I’ve learned a bit about how people relate (or don’t relate) to people with disabilities. About a month back I had a dream. I was trying to run up a small hill during a race. There were people lining the streets and cheering me on. Try as I might, I couldn’t get my legs to move quickly enough to get me up the hill. It was weird, because it didn’t feel like fatigue. I just couldn’t get my legs to go. Last weekend, when I was struggling to finish the Capital City Marathon, I thought about that dream. Yesterday, when I was pushing myself through the last mile, running up Mount Si, I thought about that dream. Not a day goes by that I don’t feel blessed with reasonably good health. I don’t know if keeping myself in good shape has a bearing or not, but it gives me the illusion of control. It makes me feel like I’m keeping my immune system strong, and my active neural pathways plentiful. Well – I did call this the illusion of control.